Par and zero coupon curves are two common ways of specifying a yield curve. Par coupon yields are quite often encountered in economic analysis of bond yields, such as the Fed H.15 yield series. Zero coupon curves are a building block for interest rate pricers, but they are less commonly encountered away from such uses. In order to avoid being dragged down with the details of fixed income pricing conventions, this article uses a basic interest rate convention, and only looks at maturities which are an integer number of years. The chart above shows the example zero coupon curve that is used within this article. The top panel shows the zero coupon rate for maturities running from 0,1,...,10 years from the calculation date. The bottom panel shows the implied discount factors for each of those dates. Note that we can define yield curves for any issuer of bonds (for example, the U.S. Treasury), or for derivatives such as swaps. Within a single currency, there are often several yield curves of interest. For real world pricing applications, the zero curve is continuous, and defined for every day from overnight maturities to some maximum maturity. The difficulty with defining the curve for every day is defining the time-to-maturity: how do we account for things like leap years, non-working days, etc. Note that there are other conventions for quoting a zero rate. If you are developer who works with pricing software, it is a safe bet that different libraries use different conventions. Therefore, the only safe way of comparing the two yield curves is by using the discount factor curve, and not the zero rates. It is possible to buy zero coupon bonds, which only pay a cash flow at maturity (these are known as strips). The price of a zero coupon bond would correspond to the discount factor. However, this market is not particularly liquid, and so is of limited interest to institutional investors. pays $1 on year T (the principal repayment). 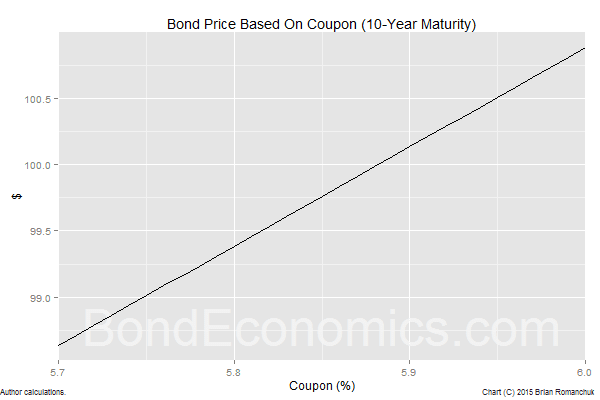 The chart above shows the present value of 10-year bonds (using the example yield curve) as a function of the coupon rate. The higher the coupon, the more valuable the bond, We see that the bond has a price of $100 when the coupon rate is 5.88% (roughly). Since we say that a bond that is trading with a price of $100 is trading at par, we then say that 5.88% is the 10-year par coupon yield. That is, if the issuer associated with the yield curve issued a bond with a coupon of 5.88%, it would trade at par. The table above shows the calculations for the 10-year par coupon yield. Within each row, the cash flow is multiplied by the discount factor to get the Present Value of the cash flow. The sum of the present value of all of the cash flows is $100 (within rounding errors). 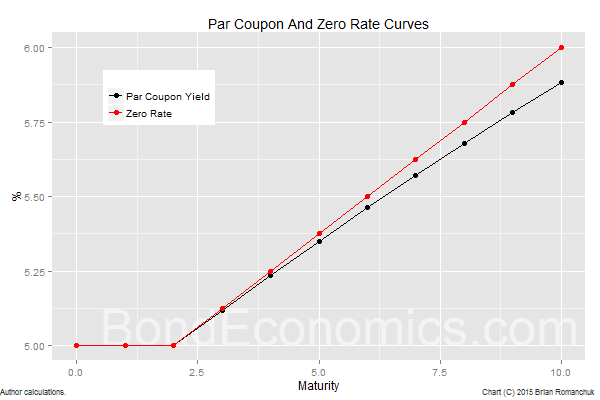 The chart above shows the par coupon yields, as well as the zero rates for maturities from 0 to 10. 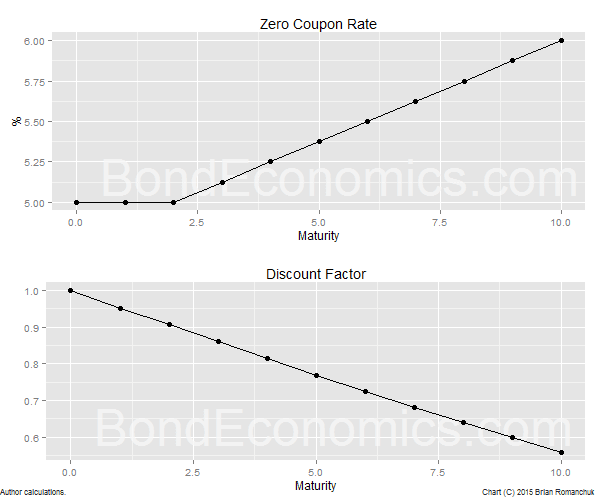 For longer maturities, the par coupon yield is below the corresponding zero rate. These bonds have coupons that are paid before maturity, and they are discounted at a lower rate than the zero rate at the maturity of the bond. This is what you expect to see with a positive yield curve slope (rates rising for longer maturities). Buying zero coupon bonds to maximise the yield of your portfolio is a common tactic. Where Do These Curves Come From? In order to generate the zero curve, we typically assume that is a function of a particular form, and we then fit the function parameters to the prices of traded instruments. In the case of bonds, what we typically find is that bonds will not sit perfectly upon such a curve. The end result is that if we compare the traded prices of bonds relative to what is predicted by discounting using our fitted zero curve, some bonds will be expensive, and others cheap. Since the benchmarks are heavily traded, they are followed widely. This can cause confusion, as benchmark bonds are often expensive relative to the curve, and so have a lower yield than the corresponding par coupon yield. For example, during the LTCM crisis, a pretty wide spread opened up between the benchmark 10-year Treasury Note yield and the 10-year par coupon yield. Although it may be sensible to make use of the benchmark yield in a pricing application, it is not a good idea for time series analysis. New benchmark issues typically start trading at a different yield than the old benchmark, and so there is a jump every time the benchmark rolls. This creates discontinuities in benchmark yield series that do not correspond to market movements. Par coupon curves are not greatly affected by the appearance of new benchmarks, and so movements in the par coupon time series are a closer match to true market movements. This is missing the point as the term "par rate" is never explained but plotted on a graph ... ??? Well, now that you raised the point, I should have broken the definition out more. Howver, it is within the text. The par rate is the yield on a bond that is trading at par (and is fairly valued on the discount curve).